~ Those who would forget the Past are doomed to repeat it. In the winter of 1982. I heard about a local art teacher who gave lessons in a private studio in Westerly. He also just happened to be a Titanic survivor- and I hoped he wouldn’t think I had signed up for lessons just to learn more about the ship! What would follow would become a precious four-year friendship filled with adventures and travels. “Titanic was something that happened to me by accident- art -well, THAT I did on purpose!” he often remarked. Marshall’s first love was photography- sunsets, trees, the nearby dunes of Misquamicut Beach on the Rhode Island shore, flowers and Nature. He left more than 10,000 slides to the Westerly Camera Club! After retiring from the New York Pratt Institute, he settled in a tiny cottage in the Dunn’s Corner section of Westerly off the coast road. An accomplished painter (particularly abstracts)- he often would say with a wry smile, “There’s a BIG difference between looking and seeing. Marshall had been visiting his grandmother in Cornwall in the winter of 1911-1912 and remembered looking up the great chimney and seeing stars at her home on the rugged Cornish coast. He had departed on Olympic in September of 1911 for the crossing, accompanied by his Aunt Lu and Uncle Jim, His mother had died when Marshall was only a few weeks old. Aunt Lu soon filled the maternal gap left by the death of Elizabeth Brines Drew. Marshall’s father was a Greenport , L.I. stonecarver, and had met his wife on a trip to Westerly’s famous blue granite quarries. Due to his diminuative size, Marshall was a great favorite with young people. He had only one daughter Bette, and four grandsons. Great- Grandson Andrew who lived next door was a constant companion in Marshall’s last years. Often we would sit in the little cottage, he strumming a ukelele and singing old camp songs or creating fanciful origami animals from colorful bits of paper- thin cigarillo hanging from his lips. Riding in his little red car was always an adventure as he drove everywhere at breakneck speed- red beret tipped to one side. The jaunty cap was filled with souvenir pins; sometimes he wore a blue Civil War cap and red suspenders. Marshall spent many summers with his Great Uncle Henry Christian, a Civil War vet, who lived in Southold, Long Island. Over the years Marshall would point with a wry smile at the memorial volumes listing him as lost in the Titanic disaster. After being hauled up on deck of the Carpathia, Marshall acknowledged the only thing he could think of was getting something to eat- and was having doughnuts and cocoa when the first lists were being compiled of those saved. When Carpathia reached New York, and a comfortable hotel found for him and Aunt Lu, he sat on the steps pricking out a silhouette of the Titanic with a common pin on a scrap of paper. Marshall became a master calligrapher and artist, origamist, and photographer. 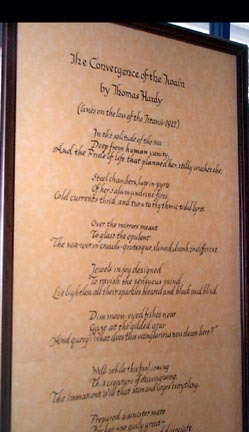 Convergence of the Twain by Hardy done in calligraphy italics two months before his death in 1986. I am a great grandson of Marshall Drew. He has always been a source of great inspiration for me… and my earliest memories are of him. I am wondering about the photos left at the westerly camera club and if I could gain access to these files. I have a single photo he took framed and it is absolutely priceless to me. If I could gain access to these photos he took that would mean the world to me. Also if anyone studied art under Marshall’s instruction I would absolutely love to speak with you. If anyone has any information for me it would be greatly appreciated. Thank you, Daniel Drew Warner. Danial, I’m a great, great grandson of his (Christopher Robin, brother to the Andrew mentioned in the article about). 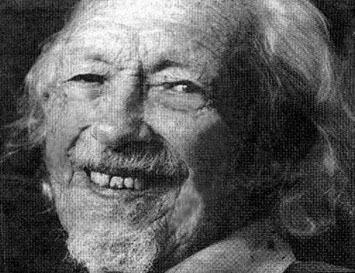 I knew his as a child and remember him teaching me “how to see” – I can still find four leaf clover quickly, the way he taught me… to stop looking for four and see the pattern of three and find flaws in the pattern. I may have access to slides of Marshall’s photography. I’m not certain but I might. Drop me a line if you’re still out there. I was in the New England Art Association along with Marshall Drew. He was a friend of my art teacher Russell Neagle also from Westerly RI. Great article and information. 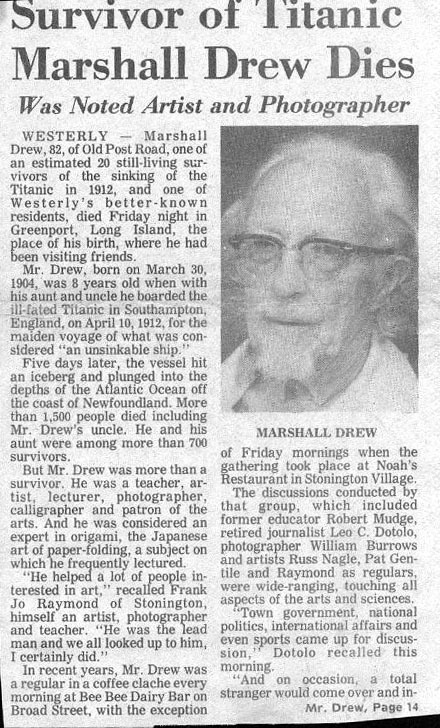 I lived in Westerly RI for many years and was grateful to have met Marshall Drew. I used to paint in Russ’s studio- Marshall used it for our evening classes. Do you have any info on Russ and his wife Alice? His portraits were amazing. 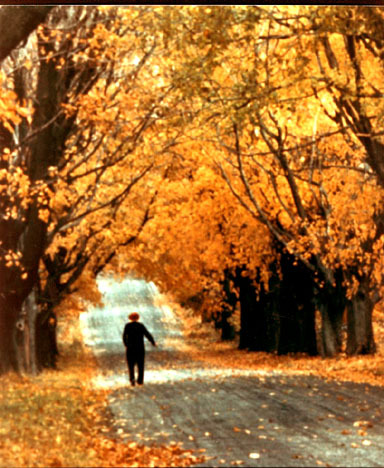 Marshall really loved his photography and abstract painting in later life. I sure do miss him. Russell Neagle passed away in March 11, 2006, at the Westerly Health Center. His wife Alice has already passed away first. He really taught me a lot about painting in his kind and gentle way. When I lived there we were all in the New England Art Associaion. I am a grandson of Marshall’s and it makes me happy to see that others still remember him as fondly as I do. The memories this page bring back are all wonderful. Thank you. He was one of a kind Ken. I often wonder how Betty is doing. I went out to visit the grave Friday at River Bend. I sure do miss him and all the fun we had. I know you do too. Of all the people I’ve known, the impact he made on my life for the time I knew him makes everyone else seem inconsequential. Shame, I’ve never seen his stone. Some people know more about his life than me. I can only wish I had the chance to know him, but sometimes I think sitting on the floor and listening to him tell me what was going through his mind while he made art might be even more valuable. Shame I was too young to understand when he left us. Well, you were so young at the time I guess. He was wonderful with kids- my two daughters liked him so much and I still have a box of his origami he made for my youngest once when she was sick. The stone is not hard to find in River Bend in Westerly. His mother’s ashes are buried under that urn next to it and his father’s first wife, Louisa Jenkins Drew is buried behind. 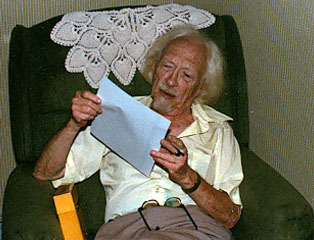 I have a photo of Uncle Jim (Aunt Lu’s first husband) I can email to you. Lu Drew Opie and her second husband Richard Opie are in Oak Grove in Ashaway, a beautiful stone Marshall’s Dad carved. He was famous for his lilies and roses. The other side of the Opie stone is a memorial to Uncle Jim. If you ever come to Westerly, let me know, I can talk about Marshall for HOURS. And I can take you over to see his stone at River Bend. Been looking for his name for years. In 1977/8 he visited my 6 grade class at Broadway School in Mystic – to demonstrate origami. He was gracious enough to share his story about the Titanic although it was stressed that was not why he was there by our teacher. I was 11 and already a Titanic buff and asked for his autograph which lays in honor in my father’s copy of A Night to Remember. I remember him as being very kind and charismatic and am to this day honored to have met a survivior and such a striking gentleman. I treasure a box of Origami he made for my daughter when she was sick, and I have several of his origami books. He used origami as an “ice breaker” and told me he learned it while teaching in New York. 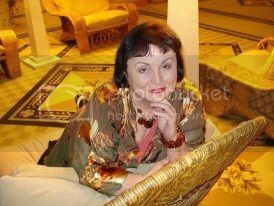 What a great blog to suddenly find! Lu was my great aunt (via Opie marriage) and Marshall was a regular at our house while I was growing up. 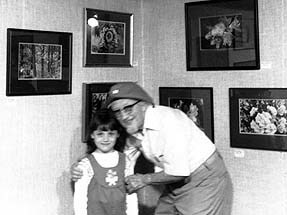 I recall his being banished to smoke outdoors but otherwise we had grand visits, with him teaching me origami and presenting Friday night slide shows of his and my dad’s photos during their years in the Westerly Camera Club. My love of art and attendance at art & photography schools were a direct result of my time spent with him. Many years after Marshall’s death, I inherited several of his oil paintings which I ultimately donated to the Titanic Museum in Indian Orchard, MA (I live nearby in the Amherst area). The owner knew Marshall from years earlier and was pleased to add the items to his collection of memorabilia. Just today I had emailed the Association of Gravestone Studies, Greenfield, MA, and sent them photos of Marshall’s and James’ gravestones which I’d photographed on a recent visit back home to Westerly. 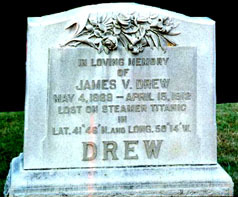 Being the 100th anniversary of the Titanic sinking, and the the Drew connection to gravestones and carving, it seemed to offer good material for their quarterly publication. I’ve just alerted them to this blog page as well. Chris and Ken, if you read this, I remember your visits with your Mom at our house. You were wild boys! I well remember your delightful grandfather and look back with affection as the Centenary of Titanic’s demise approaches. In March of 1986 he was kind enough to grant me an interview when I was a young freelancer for Maine’s Bangor Daily News. I won’t forget the interest and time he extended to me as well as to my husband and 8-year-old daughter who accompanied us to Westerly. If you see this commentary, Ken, I would very much like to share a research tidbit about Marshall I’ve recently uncovered. (Note: There were two boys playing outside to the left of his doorway who he said were his grandsons (great?). Thank you for your reply, and I apologize for not responding earlier. I have had unexpected eye surgery with a long recovery time, which meant I couldn’t use the keyboard. What I wanted to share with you pertains to the original piece that ran in the New York World on April 20, 1912, which was an interview with Marshall at the age of 8 following his rescue on the Carpathia. He told me about the reporter from the New York World finding his tintype drawing of the sinking of Titanic after he and Aunt Lulu vacated their room in the Blake’s Star Hotel, where they were put up upon their return to NYC. He had not seen the interview until a number of years later; it was later lost and he wished he’d found it. This spring I researched with the archive division of the New York Public Library and found it!! I’d love to send it to you as it is a really powerful piece from such a little boy. Also, he told me he was working on his autobiography—he’d gone as far as age 17. He showed it to me and I wonder if anyone knows of its whereabouts. As a historian, I really appreciate the cultural value that this has (if it still exists). Does this ring a bell? Karen, would you mind also emailing me a copy, or let me know where in the paper the story is? Is this the online archived issue: http://chroniclingamerica.loc.gov/lccn/sn83030193/1912-04-20/ed-1/seq-1/ ? Thanks! Marshall was a friend of mine, from camera clubs. A group of us would meet every Thursday night at the four seasons , for dinner, for many years. Before he died, I found a book on the sinking of the Titanic, that listed him going down with ship. I took it to supper,for him to sign, but he wanted take it home and do it in calligraphy. Then he fell Ill and I never saw him or the book again, I think he was sent to long island. He was a great Photographer, and loved his licaflex camera. It used to crack me up when he told us about getting up at 5:30 every morning to take photo’s in the early morning light, which he said was the best, and taking a spray water bottle, to spray the flowers, to give them that morning dew look !!! Hi Dan! Thanks for the memory- yes, I recall his days on the dunes at dawn! I took him back to Greenport to visit the Mengelweits and I stayed a couple of days. I got the grand tour of Greenport and Southold, where Marshall’s Dad and uncle had a carving shop, and other boyhood sites he loved. I was to have met him at the pier to go home three weeks later, but as you know, he became ill and never came back to Westerly. I got the call from the hospital saying he was gone. A very sad day. Before we drove off to meet the New London ferry, he had boxed up 2 boxes of Titanic things he wanted me to have, by the front door of his little cottage- letters and books and such. I was afraid to take them for fear he would think I did not believe he had long to live so I said I would get them when he returned home. We had a big memorial service in August at the Westerly library. When it was over, I went to the house, which was now rented out, so I went next door to the family. The garage was packed full, and when I inquired about the 2 boxes, nobody knew just where they were. Lesson to be learned – when somebody tries to give you something- TAKE IT right then and there. I had also been given the Titanic hat ribbon but after a year, I returned it thinking it should stay in the family. I miss him, as do so many others who knew him as a teacher and a friend. He was one of the most influential people in my life and the best perspective on life. I miss breakfast with Monroe and Bill Burrows and Russ Nagle at BeeBees and Noah’s. We had so much fun. Hi Daniel and family-I took oil painting lessons from Marshall for 15 years. We met at the Dunns Corner Firehouse and also at a center in Ashaway. What a great man to have known. I remember one night he was late for class and I said, being a teacher myself, “Mr. Drew, you’re late.” He said he was speaking to someone from Austraila who was interviewing him about being on the Titanic. It was around April 15th. I have all the paintings I completed in his classes. His touch in each one. One in particular I will always remember him as saying”this is your most accomplished” It was of Emerald Lake. He gave us origami ornaments each Christmas. I only stand at 5 feet and Marshall may have had an inch on me. I read a book to my grandson’s second grade class on Wednesday. I made a poster about various facts. One side is dedicated to Marshall Drew. I can’t wait to go to the Mystic Aquarium to see Robert Ballard’s creation..I live a mile or two from the aquarium. This was wonderful. Thank you for writing it. Meeting Mr. Drew is something that has long stayed with me throughout these 27 years. As an elementary student I interviewed Mr. Drew for a project I did with a gifted program on the Titanic. I even dressed up like him with suspenders and my cap backwards and did presentations throughout my school. I made the pinpric titantic too. Looking back at his origami and the tapes I made of the interview, I realized what a truly amazing opportunity it was to meet him. I was one of the last people to interview him about the ship. Thanks again– this brought back a lot of memories, especially now living in Rhode Island. 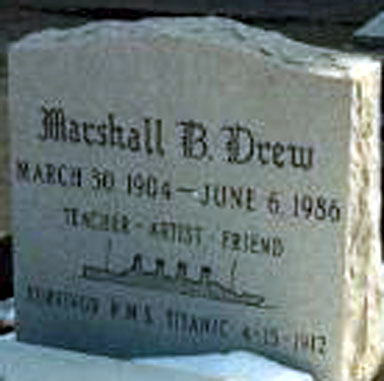 Mr. Drew’s (as I called him) name came up when I spoke with my friend who said she is so interested in the Titanic story. I told her that Mr. Drew was my art teacher.at Grover Cleveland High School in Ridgewood, NY. He was also the teacher of the “Origami Club” at the school. I remember him as being so good at his craft, kind and patient. At the time when I was a student, I knew he was a Titanic survivor but I never asked him about it. I only wondered each time I saw him, what it was like for him to have been on that ship. My grandson Jack Henderson is an avid Titanic enthusiast. This Saturday he and I are hosting a small family party at the Netherland Hotel, to honor the Titanic. Jack is 8 old and we have chosen Marshal Drew as the survivor of interest because he was 8 as well. If anyone connected to Marshall can e-mail me I am trying to get some kind of message sent to our hotel and delivered to our table at dinner to boost the experience and add excitement to the overall interest of the evening. I recall many many visits with Grandpa Marshall Drew and Great Grandma Opie in my childhood. Though I am not related, my foster parents Barbara and Cliff Davis (owner of Westerly Tire) adopted Marshall’s grandson and Bette Drew’s son Geoffrey Alan Drew / adopted as Jeffrey Alan Davis. I remamber having several beautiful oil paintings by Marshall in my home and that of Barabara Davis’ Mother Sandra Kashel of Oxford CT. I also was thrilled with Marshalls oragami lessons in his small cottage on the property of his Aunt Lulu Opie. I also recall seing him many times at Art Festivals in the area. It is so cool to know that he was the young 8 year old budding artist on the Titanic….far d.
It wasn’t until a few years ago, that I learned Marshall had passed away in 1986. I am still saddened when I think about his demise. I have read of the enriched life he went on to have after Titanic and he is a true inspiration.